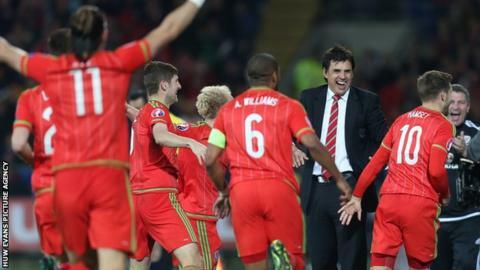 Wales assistant Osian Roberts says manager Chris Coleman is a ''great leader'' after guiding the national teams to the Euro 2016 finals. Next summer's finals in France will be Wales' first appearance at a major tournament since 1958. They face the Netherlands on Friday and Roberts believes Coleman is growing in stature as an international boss. "I don't think there's another international manager that we've faced that's got the better of him," he said. Former Fulham and Coventry City boss Coleman, 45, was appointed Wales manager in January 2012 following the death of Gary Speed. Wales lost Coleman's first five games in charge, including a 6-1 defeat in Serbia, but the former defender has led his country to a major finals for the first time since the 1958 World Cup. The circumstances in which Coleman took the role were "impossible", but Coleman has "managed to turn it around," said Roberts. "He's got a great personality and the players want to play for him and you can see that they love him and respond to him. "He's got a great relationship with every individual in the squad and he's also developed tactically to become far more aware. "He's just a great leader." Coleman wants his players to treat Friday's friendly against the Netherlands at Cardiff City Stadium like a qualifying match. Wales will be looking for their first win over the Dutch, who failed to qualify for next summer's European Championship finals. "It's another chance to go and perform for our country and that means everything," Coleman said. "That's been the foundation of the success we've had up to this point and the journey we're still on. "We must never forget what's made us a very tough team to play against. "We don't give results up easily and that always must be the same."